For most people, achieving a healthy, beautiful smile is the reason for choosing to receive orthodontic care. 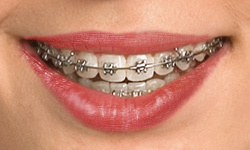 If you’re self-conscious about your smile, braces will greatly improve the way you look and feel. Orthodontic appliances are made of metal, ceramic, or plastic. They may be removable or they may be brackets bonded to the teeth. By placing a constant, gentle force in a carefully controlled direction, braces slowly move your teeth to the proper position. Gone are the days when a metal band with a bracket was placed around each tooth. You can now choose from brackets that are clear or metallic, and in some cases, the color of your appliance. Wires are far less noticeable, and the latest materials are designed to move teeth faster with more comfort. Today, any age is a great time to wear braces! Depending on several factors, including age, treatment method, and how minor or severe your case is, treatment time varies and can last between one and three years. A big factor to a successful treatment is you, the patient! The more involved and diligent you are, the quicker and more efficient your treatment will be. For children, receiving interceptive, or early treatment, can also help ensure quicker treatment time later in life. Dr. McDonald or Dr. Gruchalla will discuss all your options and provide a referral to an orthodontist if indicated. Please contact our practice to schedule an appointment and learn more about orthodontics. 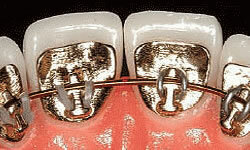 Traditional metal braces are the most common type, and are more comfortable today than ever. Made of high-grade stainless steel, they straighten your teeth by using metal brackets and archwires. 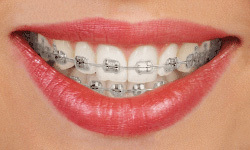 With metal braces, you have the option of adding colored elastics (rubber bands) for a more unique and colorful smile. Self-ligating braces come with traditional metal, ceramic, or clear brackets. They are the same size as metal braces, but they use a specialized clip in place of elastics to help the archwire guide teeth into place. The clip helps reduce the amount of pressure placed on the tooth and requires fewer adjustments because there are no elastics to replace. While they are visually less prominent, they require more attention to oral hygiene, because ceramic braces are larger and more brittle than their metal counterparts. For these reasons, ceramic braces tend to be used more on upper front teeth rather than on lower teeth. Clear aligners are a series of invisible, removable, and comfortable acrylic trays that straighten your teeth like braces. Not only are the aligners invisible, they are also removable; so you can eat and drink what you want while in treatment. Plus, this helps to make brushing and flossing less of a hassle. The aligners are comfortable and contain no metal to cause mouth abrasions during treatment. Gold braces are similar to traditional metal braces. Like traditional metal braces, gold braces are made of stainless steel; however, they are uniquely coated in gold. Some regard the gold coating as a more cosmetic option than traditional metal braces. And the cost of gold braces is surprisingly comparable to most clear braces. Lingual braces are hidden behind the teeth and are therefore “invisible” when you smile. Lingual braces are 100% customized to match the shape of your teeth; the metal appliances are created uniquely for you. They’re a very reasonable option for athletes, models, actors/actresses, musicians who play wind instruments, and adult professionals.